The debate over which is better or to use one at all will continue forever. Paddlers who love rudders will always use a rudder, paddlers who love skegs will always use skegs and paddlers who don't want to use either, will never use a rudder or a skeg. Why don't kayaks go straight? Kayaks usually go straight, but add in: waves, currents, tides, wind and anything you can imagine... sometimes kayaks have a tough time going straight. And that is when a rudder or a skeg can make the paddling much easier. This is not to say that when there is no skeg or rudder on the kayak, it still will go straight with the proper paddling strokes. It just will become easier to paddle when a rudder or skeg is used. When wind blows across the deck (from left to right or right to left), the kayak will weathercock into the wind. If waves roll under the boat or tides are going perpendicular to the direction of the kayak, the boat will not travel in a straight line. The danger of all this is that you will have to use much more energy, the kayak might not head in the direction that you planned, the kayak might travel much greater distance or maybe you might even capsize. All these situations can be potentially avoided with a rudder or a skeg. Even a strong and experienced paddler can sometimes use the help. Most experienced paddlers that have a skeg or rudder hardly ever use them, but when they do, they are very thankful that they had the option. Some kayaks don't have the option of having no rudder. That is due to the fact that the kayak is too hard to paddled without one due to the design and size of the boat. If the kayak has no option, take a good look at that kayak before purchasing it. Longer, non-plastic kayaks will be easier to paddle than the shorter, plastic kayaks. If you are paddling in the ocean or paddle in areas of ever changing conditions, then a skeg or a rudder may be a wise decision. Fast changing weather conditions on the ocean mean tougher paddling. 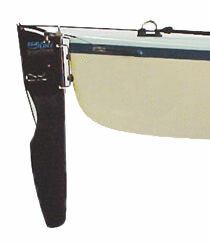 A skeg or rudder is NO substitute for learning all the strokes as both are mechanical and they can break at any time. A stone can be caught in the skeg to make it unusable during tough conditions. Rope or wire can break making the rudder unusable, too. If you rely on either one to help you out, you are totally out of luck. Also remember that a rudder is not for steering. There is no right or wrong answer to the age old debated question of rudder, skeg or none at all. I have a rudder and the next boat I purchase will not have a rudder. The reasons are that the rudder gets in the way of rescues, towing and other aspects of kayaking. But whatever you decide to choose (rudder, skeg or none), it will be the right decision for you.